Chad Pecchi is the proud owner of Shop 102, located in Marietta, GA. Shop 102 can handle all of your fabrication and welding needs. 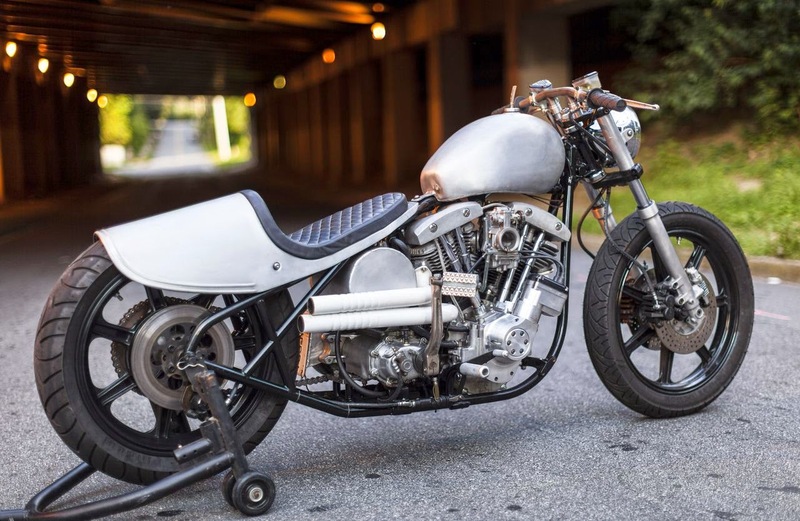 Chad also creates one-off handlebars and taillights, and loves to wrench on any style of motorcycle. I’ve personally known Chad for many years. It’s very refreshing to see someone receive national attention, yet remain humble. I would like to wish Chad continued success. Most recent two-wheeled adventure? Ridng to Dallas, TX to meet my dad. We had never ridden before so it was very special. Took our time coming back and just enjoyed it. Who were your influences growing up? Growing up in Georgia, there wasn’t much of a scene. The guy that did it for me was Hank Young. He absolutely blew my mind….still does. What were some of your first jobs in the industry? Never worked in the industry. When did you open Shop 102? On my 30th birthday, March 2nd 2012, was when I went full time. What parts do you create? The main parts are Taillights and Bars. Most people dream about being on television. Do you feel BIKERLIVE helped your business and brand move forward? The Bikerlive show was an absolute blast and I would do it again. It has helped some, but not nearly what people expect. Proudest moment? My sobriety….its the reason I have everything in my life. If I lost my right arm? You know its funny, Jasin Phares said exactly what I would. Thanks to my wife Rachel, my children, Mac and Harper, and everyone that has supported Shop102 over the years. Check out Chad's website,http://www.shop102moto.com, and give him a follow on Facebook and Instagram. Very talented Fabricator, someone I look up to. Congrats Chad. Super nice guy. Glad to see him get some recognition that he definitely deserves. Thanks guys and thank you Lisa for this opportunity. Big thanks to Scott Adams for taking that first pic!! Right on! Another dude that listens to Jazz while he works. Miles, Brubeck, The Bird, Cannonball Adderley, Hank Mobley, Sonny Stitt, and Freddie Roach are a few of my favorites. Gonna look him up next time I'm in Warner Robbins visiting my son for sure! Chad is a good dude. Glad I know him. Chad is one down to earth mofo. I'm stoked to see his shop doing so well!